A new year is upon us! We hope you had a wonderful holiday season and are looking forward to the year ahead. As is tradition, beginning a new year is often about turning over a new leaf, drafting and implementing resolutions, and in the world of décor and design: Pantone’s Color of the Year! A Year of Flowers is a classic flower subscription with a new bouquet arriving every month. This year, these traditions all seem to be connected. At Calyx, we feel there is something incredibly refreshing about the idea of new beginnings and apparently, the Pantone Color Institute feels the same way. Greenery has been crowned the reigning color of 2017. As Pantone puts it, the color “Greenery is symbolic of new beginnings.” Green has always been known as a refreshing color, full of health and vitality and this particular shade is a perky, yellow tinted green that reflects the beauty of the natural world. Green is also known as “nature’s neutral” which is lovely and symbolic of this time of year – a clean slate to start the year off right! 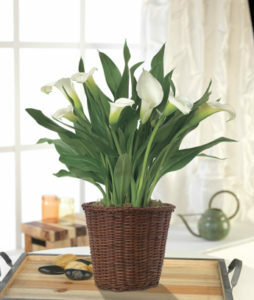 Stick to the theme of Greenery with a Year of Plants and receive a new plant in a decorative basket all year. New Year’s resolutions are always a popular way to begin the year and we can’t help trying to think of innovative ways to refresh and orchestrate a bright start to the year. Resolutions often revolve around trying new things, having new experiences, and appreciating those around us. 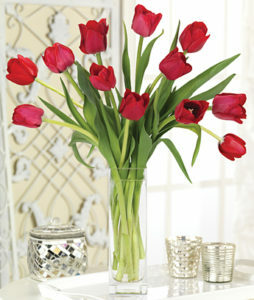 All of this can be achieved through any one of our Monthly Flower Gift Programs. For those who are unfamiliar, our flower of the month club isn’t all about flowers as we have a variety of programs to send bouquets, wreaths, plants, and more to arrive at your door every month. And it isn’t necessarily all about the delivery, either. It is the significance of the arrival of a gift from a well-wishing friend or the act of giving and renewal every month as you send a flower gift subscription to a loved one. We believe that this is the easiest way to keep a resolution for the new year: order early and reap the benefits month after month in the form of live, seasonal floral arrangements. This is an innovative way to either send a gift for the months ahead or to bring new décor into your home decorating throughout the year. As we mentioned before, we offer an array of options from the traditional flowers every month to our exclusive seasonal designs that come in many different forms. 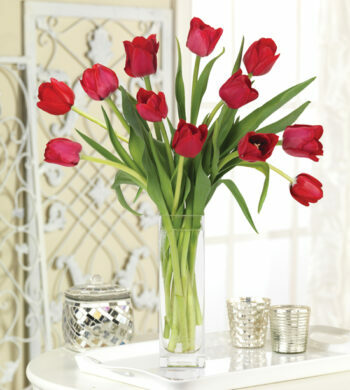 Our most popular flower of the month club, the Year of Flowers, is a classic. 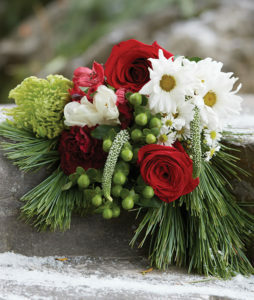 Bouquets of fresh-cut flowers arrive at the recipient’s doorstep every month featuring impressive designs and interesting combinations sure to catch the eye. This monthly flower delivery arrives with something different every month but always with 10-15 stems of the world’s most beautiful blooms. We think this flower subscription program is the perfect choice to keep things lively and ever-changing around the house. As seasons change, so do our Grower’s Choice Subscription bouquets which utilize seasonal blooms. A Year of Plants adheres to the theme of “Greenery” as you stick to your resolutions all year long. For plant lovers or those literally wanting to turn over a new leaf, our monthly plant delivery ensures that a different plant comes to you or your recipient. If you know someone moving into a new home or has always wanted to try for a home garden, receiving our plant of the month would be a welcome and appreciated gift. From hearty green potted plants to more colorful options, our live plants always arrive with a decorative basket, ready to brighten up any home of office. A Year of Seasonal Designs brings you a unique design meant to represent the season. for something new and different every month. This flower program will keep you surprised and delighted as you see a custom designed floral bouquet, made just for you, on your doorstep. And last, but certainly not least, is what we consider our pièce de résistance: the Year of Seasonal Designs. If you or somebody you know is working on home décor and focusing on interior design this year, this is a wonderful gift program. 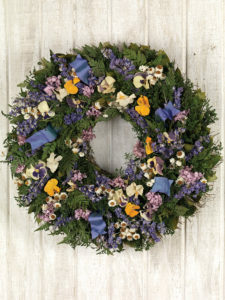 Each month, Calyx delivers a preserved wreath, centerpiece or basket that coincides with the season. This is also great for anybody that loves to entertain and likes to decorate their home with seasonally appropriate, festive items. New Years’ resolutions are often notoriously difficult to stick to, but that’s the beauty of our monthly flower subscription. Sign up now and receive gifts all year! That way, your recipient, whether it be family, friends, or yourself, will be feeling the love all year with one simple order. We hope these options will keep you sticking to those resolutions but also to bask in the Greenery as we head into a bright and new year. Here’s to a happy (and green) 2017!